Records obtained by News 5 shed new light on the myriad of issues and code violations city inspectors uncovered in late June at a low-income apartment complex on Cleveland’s east side. Among the issues identified by the Rental Inspection Unit were leaky pipes, faulty electrical and more than two dozen smoke detectors that were either missing, not working or out-of-date. News 5 has been investigating allegations of deplorable living conditions and deferred maintenance at the low-income apartment complex for months. Many if not most of the tenants at the 122 unit complex have their rents partially subsidized by the U.S. Department of Housing and Urban Development (HUD). 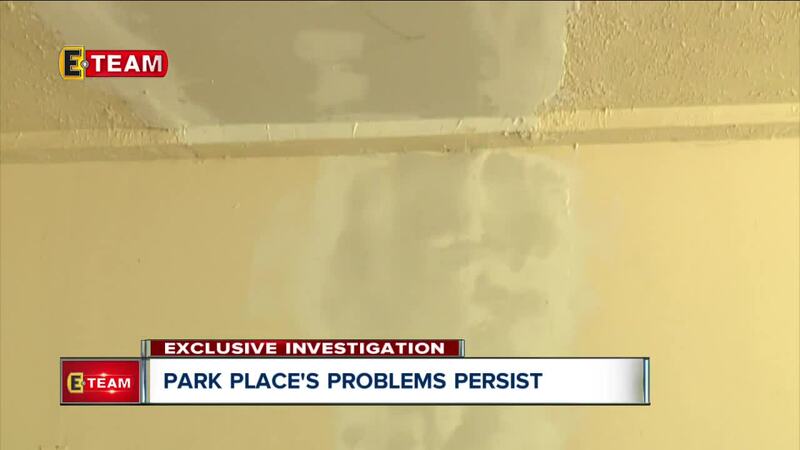 The issues at Park Place include persistent leaks from the roof and plumbing fixtures, the presence of mold, broken furnaces and air conditioning units, and stoves and ovens that don't work. One tenant’s leaky ceiling from an upstairs shower caused the floor in her dining room to begin to rot. At one point, mushrooms began to grow. Inspectors from Cleveland’s Rental Inspection Unit and Health Department converged on the complex in late June a three-day review of the complex’s 122 apartment units. As part of the lengthy inspection, city officials ensure that the apartment units are safe, sanitary, clean, maintained, and pest and contaminant-free. Inspectors will also make sure the unit’s air conditioning and heating works. Inspectors will issue violations to the landlord if issues are found, city officials said in a release. According to records obtained by News 5, inspectors found a total of 54 different violations in the 53 units that were surveyed. The violations only include those determined by the city’s department of building and housing. News 5 has also submitted records requests for the violations levied by the city’s health department as well. Those records have not been produced yet. The violations included 22 citations for faulty, missing or out-of-date smoke detectors – an obvious hazard in the event of a fire. Records show there were six citations for leaky pipes in the bathrooms. There were also four violations for flaking or peeling paint and five more violations for holes in the walls of the apartment units. Other violations included a broken window, sliding glass door and front door hardware. Park Place Apartments is owned by Michigan-based American Community Developers. The property is also managed by Independent Management Services, which is also based in Michigan. Company officials have previously told News 5 that they remain dedicated to working with the city. Additionally, company officials defended their track record regarding maintenance. The complex also has an “aggressive” pest remediation program, company officials said. About a month after the city wrapped up the inspections, officials from HUD were on the property completing their annual inspection of Park Place. According to inspection records obtained by News 5, the complex earned a barely passing score of 62 in its most recent inspection. City Councilman Kevin Conwell (Ward 9) has made it a priority to compel the owners and managers of Park Place to improve conditions there. Right now, the companies are falling well short, he said. “They’re not benefitting the residents. They’re not helping people. They’re not taking my residents out of abject poverty,” Conwell said. Many residents that News 5 has spoken to in recent weeks have said they’ve noticed an uptick in maintenance-related activity on-site. However, with the number of issues present at the expansive complex, the maintenance staff has a long way to go, tenants said. Tenants also alleged that maintenance staff was so inundated, many projects were being started but never finished. Tenants provided News 5 with pictures showing that holes in the walls had been patched but not painted over. 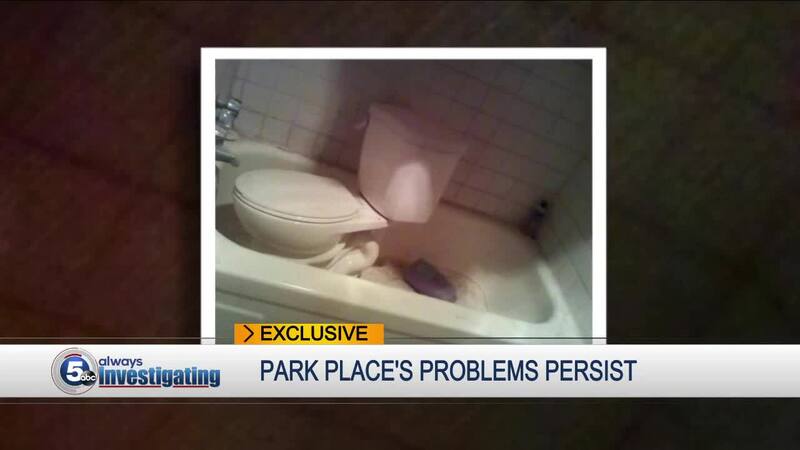 One tenant’s toilet that was being replaced sat in her tub for three days, forcing her to have to use her neighbor’s bathroom. “They’re working on it. They trying to. If not, I’m going to have to move out and find somewhere else to go,” one tenant said.